When a pioneer of Fashion Journalism in the electronic, print and digital media, a banker by profession and a qualified MBA; a LUMS graduate with Banking, HR, Corporate Training & Development expertise come together to form a brand ideology, the end result isn’t some boring old financial corporation! It’s the Pink Tree Company which came into existence 5 years ago and is thriving and flourishing in Pakistan and internationally. 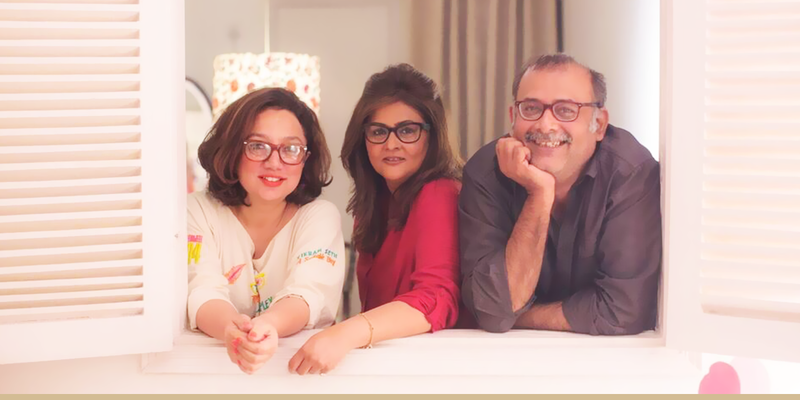 Mohsin Sayeed, Hadia Khan and Sheena Rizvi are the minds behind The Pink Tree Company and have created a brand that exudes quality. FUCHSIA got talking to all 3 innovators in order to discover the minds behind the brand. FUCHSIA: What is the brand ideology behind The Pink Tree Company? The brand ideology is producing elegant, timeless clothes that discourage fast-fashion. We are a socially and environmentally conscious label. We demand quality in our production and finishing, and seek to imbibe influences from cultures around the world, while remaining firmly rooted in Pakistani heritage. FUCHSIA: How does TPTC stand out from other brands in the market with such a mushroom growth of self-proclaimed designers at every nook and corner? This is a difficult yet interesting question to answer because we usually remain focussed on our work and rarely indulge in comparison. We feel just like every human being, every designer brand should also be unique as it reflects the minds behind it. The only thing that we consciously practice at The Pink Tree, more of a rule of thumb – is that we do not follow trends. We do what we are feeling at that particular moment; be it colours, hemlines or silhouettes. And then another thing that sets us apart is our love for classics. To give classics a contemporary twist without destroying the essence is both fun and challenging. FUCHSIA: We have heard TPTC will be participating in the London Fashion Week? Yes. We are very excited about the LFW 2017. We are preparing a capsule collection under the mentorship of British experts in design, branding, fair trade and new business development. FUCHSIA: There is a lot of variation in the collections we have seen by TPTC in terms of colours as some were bold and bright while some very ethnic. Was that done particularly for the Singapore market or is that your style in general? As stated earlier, we do what catches our fancy. Jewel tones to Vintage Pastels to Nudes will be found in our collection at a particular point in time. Because frankly speaking, we are greedy to bring the world into our collection. FUCHSIA: What statement does a TPTC piece make? Clothes with strength, style & soul. Aged between 20-65 years (While the buying power rests with the 30+ target market, the design sensibility appeals to the 20+ who aspire to wear us). FUCHSIA: There is a huge number of fashion designers and fresh-out-of Fashion School grads in the Fashion Industry. How do you manage to stay afloat? Wear blinkers and do what we love! FUCHSIA: Would you hire fresh graduates? What would the criteria be? Absolutely! Whoever is in sync with our brand ideology. FUCHSIA: What is lacking as a business in the Pakistani Fashion Industry? How does TPTC fill in the gaps? So much is lacking that it is mind boggling. The recognition of the business of fashion at state and corporate level is severely lacking. So to begin with, structural organization like proper marketing consultancy and state patronage is not there. Institutional financial reach is extremely limited to big brands only. This limits the growth options for small but enterprising brands tremendously. The skill set required to complete an envisioned garment is becoming scarcer and scarcer. We have Design Schools for designers but nothing for the skilled workers who will complete the collection for the designer. We are neither big enough nor make any tall claims to bring about a change at the macro level. However, we avail every opportunity to be the change that we want to see. If at any time we see an avenue where these challenges can be addressed, we raise our concerns. Currently we are focusing on our own learning, be it through workshops, seminars, or reading available literature on the business of fashion, or just conversations with market influencers. TPTC team tries to extract solutions. Mohsin Sayeed: One of the pioneers of fashion journalism in the electronic, print and digital media in Pakistan, he has worked as design consultant and adviser with leading designers and multi-brand stores. He is currently a member of the out-reach committee of Karachi Biennale of Pakistan 2017. He is also a cultural & social commentator for various print & online publications and TV channels. Hadia Khan: A banker by profession and qualified MBA, with a very keen interest in international and local political affairs. Hadia has a diverse professional history in banking, telecommunication, human resource development and the business of fashion. Sheena Rizvi: A LUMS graduate, Sheena brings in Banking, HR, Corporate Training & Development expertise into the business. Her strategic management and planning steers the TPTC business.